In recent, the government and the ruling party meet with the business circle in a series of gatherings. The agenda is set to discuss the job creation and pending issues, but the labor circle is not pleasant to observe the move. Whenever the business circle meets with the government and the ruling party, they never fail to demand the expansion of the unit period of the flexible working hour system and complain of the minimum wage hike. The government responds that it will address the shortcomings and also calls for the job creation. The Economic, Social and Labor Council(ESLC) is currently discussing the institutional improvement for the flexible working hour system and the ratification of ILO core conventions. Concerns are being raised that the direction of the labor-related institutional improvement will be biased by the influence of such gatherings of the government and the ruling party with the business circle. Economy and Finance Minister and Deputy Prime Minister Hong Nam-ki met with Sohn Kyung-shik, Chairman of the Korea Employers’ Federation(KEF), Park Yong-mann, Chairman of the Korea Chamber of Commerce and Industry(KCCI), Kim Young-ju, Chairman of the Korea International Trade Association(KITA), Park Sung-taek, Chairman of the Korea Federation of Small and Medium Business(Kbiz) at the KCCI main office in central Seoul on January 16. On the same day, Employment and Labor Minister Lee Jae-kap also had a talk with chief human resources officers(CHRO) of the 30 largest business groups at the Press Center in central Seoul. These events were held, following a gathering at the Blue House just a day before to which President Moon Jae-in invited 128 business tycoons including Lee Jae-yong, Vice Chairman of Samsung Electronics. 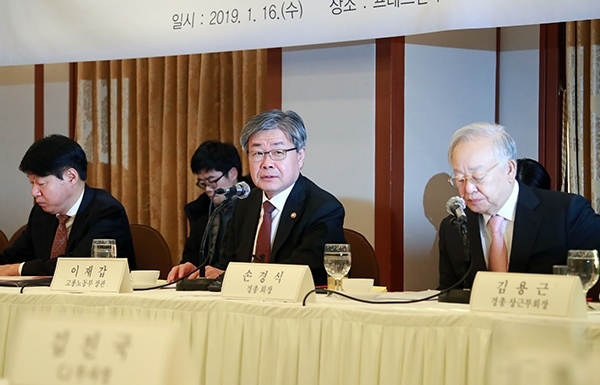 The leadership of the ruling party including its floor leader Hong Young-pyo also held a New Year’s gathering with the heads of the four business associations. People suspect that the government and the ruling party have effectively come to a conclusion that the unit period of the flexible working hour system will be expanded the current limit of three months to six months and the minimum wage fixing machinery will be restructured with the dual decision-making system. It is also believed that the recommendation of the public interest members regarding the ratification of ILO core conventions is likely to accommodate part of the business circle’s demand.